All-in-one access to your business reputation. ReviewInc provides all-in-one access to manage your online reputation with UNIQUE customizations for a tailored, faster, and stable experience. ReviewInc grants access levels for every type of user, so multiple team members can manage your reputation using just the features they need to do their job. The platform also includes an optimized email system designed to get you past the spam filters—critical when sending thousands of requests to review your product or service. Unlike other online reputation management software services that provides a “light” app with scaled down features, ReviewInc has full feature web access optimized for mobile devices. You get the same powerful mobile capabilities as a desktop at ultra-fast speeds. ReviewInc delivers secure admin access with full data encryption, double encrypted passwords, including the unique ability to hide client’s names, making it one of the industry’s most secure review management platforms with full HIPAA Compliance. ReviewInc is renowned for reliability. Monitored 24/7 with a minimal 99.9% verified uptime, you’ll be able to monitor review and increase the ability to respond to negative customer reviews before they cause damage. Thorough analysis of your business reviews. 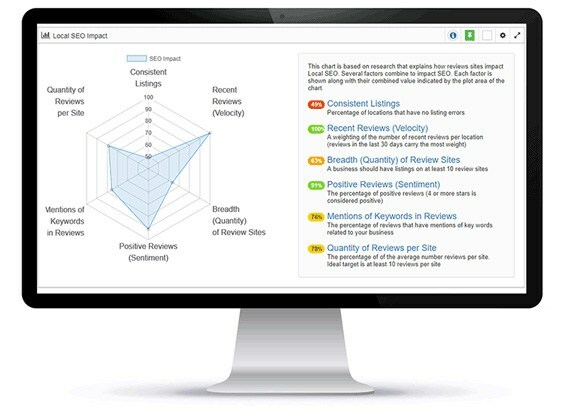 The ReviewInc online reputation management software provides everything you need to properly monitor and manage your reviews, including competitive rankings, ratings and reviews over time, timeline reports, with customizable filters, even showing if your listings are consistent. The email reports with detailed graphs can be customized to match your brand identity and company logo. ReviewInc monitors the MOST review sites of any other online reputation management service (over 600 vs less than 250 with other online review services), ensuring you have the widest coverage and reduces the risk of missing any review opportunities. The most versatile review generation software. ReviewInc provides the most versatile online reputation management software with marketing campaigns and market research surveys designed around your business to get more customer feedback which converts into public reviews online. A panoramic view of your entire online review flow is available on one interactive screen, including customized email and SMS campaigns, private customer feedback option, thank you notes, and follow-up messages. ReviewInc is the ONLY Online Review Management company that offers 26 different languages, providing you unlimited global access for local and international business reputation management. Fully customizable market research surveys raise instant awareness about your product or service, and when necessary, creates the opportunity to improve the overall customer experience. Unmatched report customization & response management. ReviewInc offers the best online reputation management software within a fully comprehensive customer review dashboard. Monitor customer reviews with unmatched report customization and instant review notifications. Respond directly to customer reviews, enjoy the unique ability to find review sites, and let ReviewInc fix the broken links for you. Review Site Auto-Fix Link Management. Your customer reviews are valuable and missing reviews can cause negative feedback to go unnoticed. With ReviewInc’s online reputation management service, the software automatically finds, monitors, and fixes review site links, guaranteeing you won’t miss your customer reviews. ReviewInc’s online reputation management system includes an easy-to-use workflow where you manage negative review resolution, generate Issue Resolution reports and help convert your customer experience into positive reviews. ReviewInc also integrates with popular support ticket systems and CRM platforms to reduce double entry and ensure thorough follow up. Stay 100% current with your online business reputation with customized alerts every time there’s a review . Prioritize responses by filtering these alerts by source and star rating. All the necessary tools to boost your reputation. Other online review management services host your customer review testimonial microsite off their website, generating SEO traffic for them, not your business. ReviewInc includes an app/widget that allows you to implement the microsite off your own site giving you the SEO traffic advantage. MOST powerful online reputation management rules. Review Testimonials on Your Site. Ensure your website always has the freshest content with new public reviews and private customer feedback. ReviewInc’s customizable SEO Impact Analysis shows exactly where your company reputation stands and how to boost your online rankings. ReviewInc is one of the few online reputation management systems that can associate your testimonial review stars to your Google business search listings. With rich snippets, testimonial review stars provide a distinct “attention getter” advantage. Results at an affordable price. Save time with the automatic integrations with your CRM. Add as many team members to the platform as you wish for no additional cost. 10 hours weekdays, 8 am to 6 pm PT.